This large cushion is made from cotton and silk ribbons joined together. These hand embroidered ribbons were used to decorate the borders of Miao Skirts. Every bit of pattern you can see is hand embroidered with the most exquisite accuracy. The colours are varying shades of brown and gold and were probably originally pink. The dyes used are natural and change over the years, allowing us to date it to the early part of C20. 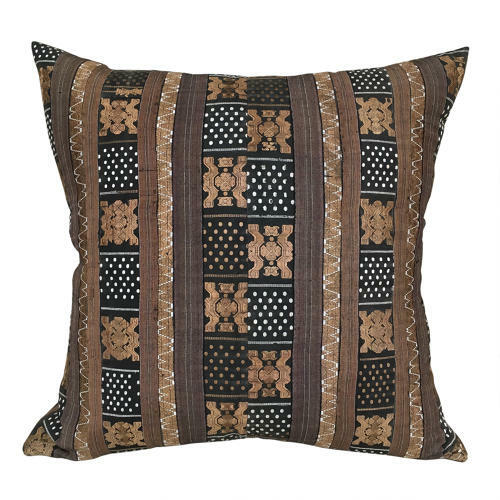 The cushion is backed with an overdyed antique ticking in brown and black, has zip fastener and feather pad.